With the weather forecast for tomorrow looking very wet, the radios in the park event is canceled—although you’re welcome to tough it out if you want. With luck, Saturday September 9th will be conducive to park-based radio events. If you’re interested in helping to organize things for that, please let me know as I could really use the help (AE0EE arrl net). Grid map of the continental US, showing the eclipse path. Image credit: Bill Mitchell (CC-BY). 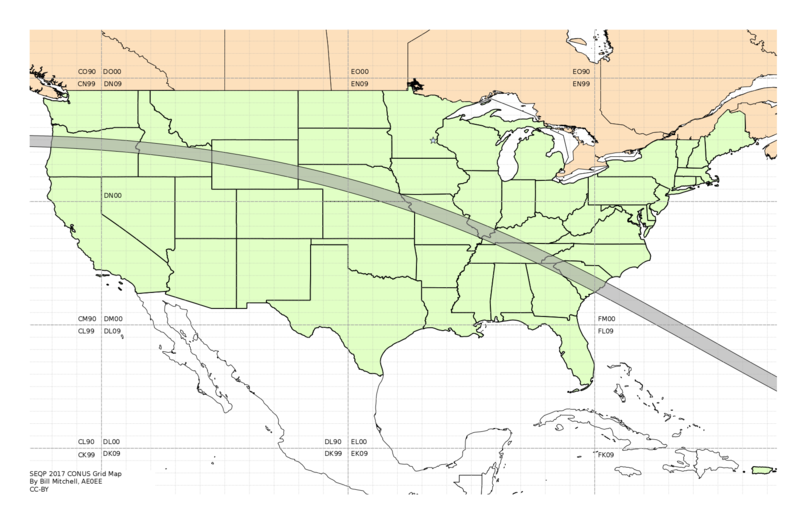 With the solar eclipse QSO party coming up, here are grid maps for the continental US which you can use to track stations you have heard during the eclipse: 8.5″x11″, 11″x17″. This coming weekend is the ARRL 222 MHz and Up Distance Contest. Taking place on the VHF, UHF, and microwave bands, all licensed US amateurs have full privileges for frequencies in this contest. Most of the action will take place on weak-signal modes (single sideband, Morse code, and various digital modes), but there is still room to play on FM! All it takes to get started is a dual-band FM handheld. Under the rules of the contest, you can coordinate contacts (i.e. plan frequency, mode, and time with another station) via internet, cell phone, or other amateur band. For FM on 70 cm, set your radio to 446.000 MHz and make sure that the radio is set to simplex (no repeater offset). You will also need to know your 6-digit gridsquare. If you’re interested in getting into VHF/UHF contesting, there are two guides under the Membership | Resources tab. One is a two-page quick-start guide to VHF/UHF contests, and the other is a more comprehensive introduction to the subject. With FM contesting, it helps to target a specific time to get on. I’d encourage everyone to try to be on from 4:00 PM to 4:30 PM local (2100-2130z) on Saturday, and 12:00 PM to 12:30 PM local (1700-1730z) on Sunday. I hope to hear you on the air, and don’t forget to submit your log after the contest!